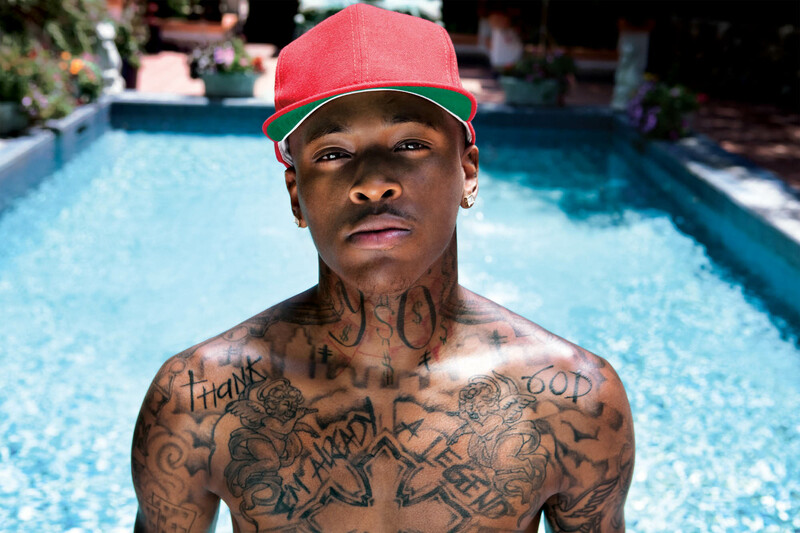 23-year old Compton rapper YG (also known as Young Gangsta) is coming off the back of a great 2013, filled with well deserved successes. All the tracks he released in the past twelve months, have been non stop hits and club bangers including “You Broke”, “Left, Right”, Kirko Bangz’s “Versace”, Young Jeezy’s “R.I.P (Remix)” and “Hella” by Wale among others. His latest single “My Ni**a” featuring Young Jeezy and Rich Homie Quan kept the streets buzzing and social media audiences reveling at the song’s resounding brilliance and originality – “My Ni**a” even charted at #19 on the US Billboard Singles Charts and went on to be certified platinum, becoming the biggest hit of YG’s career to date. The song gained a lot of notoriety and respect, not only from critics and audiences, but also from his music peers, which birthed the influx of many remixes of the single – one of which was the official All-Star remix which featured some of the hottest rappers in the game including Nicki Minaj, Meek Mill and Lil Wayne. YG is no stranger to the music game, having started his own record label and group in 2008 called ‘Pu$ha Ink‘ with DJ Mustard. He shortly released songs on the internet such as “She A Model” and “Aim Me” which created a huge buzz online and got YG a large internet following, which in turn got him signed to Def Jam in 2009. He released his debut single titled “Toot It and Boot It” which featured Ty Dolla Sign in 2010 and although the track peaked at just #67 on the Billboard Hot 100 chart, it became a breakout hit for both artists. Fast-forward to 2013 and after the success of “My Ni**a”, an unfinished version of his new single “Who Do You Love” was leaked on the internet in December, and even though “Who Do You Love” was leaked, it did not take away from the brilliance of the record. With YG poised to release his debut album My Krazy Life in March, it was only right for “Who Do You Love” to be released in all of its mastered glory so we can hear the hit in the way its creators intended. Produced by DJ Mustard, the single also features a guest appearance from Toronto’s very own Drake in what can only be described as a master stroke as it certainly gives YG that much needed momentum and mainstream appeal as he continues his rise to super stardom. The musical backdrop is simple yet effective, with its trademark West Coast feel, ominous drums and sparse keyboard arrangements plus DJ Mustard’s milieu does not drown out the commanding and braggadocios lyrics offered up by YG and Drake and from the very first word said on “Who Do You Love”, you are automatically engaged – from the authoritative raps to the infectious and catchy chorus. By all accounts, YG definitely has another winner on his hands.